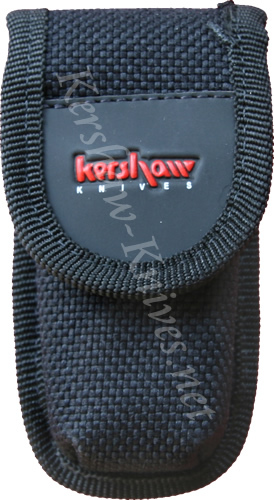 The Kershaw name is proudly displayed in red on this model 3120E, a black heavy duty nylon sheath. You can be assured that your knife is securely enclosed thanks to the strong hook and loop fastening system (velcro) used to close the sheath. You have the choice of carrying the sheath vertically or horizontally, whichever you prefer. The 3120E sheath is compatible with a variety of the smaller folding Kershaw knives including: 2420 Models, Black Gulch, Avalanche, Vapor, Scallion, Chive, Leek and Black Colt II.